Don’t believe us? Check out just a few of our favorite unbeatable benefits below! Although Wears Valley is located just a short drive from the hustle and bustle of Pigeon Forge, guest staying here will be pretty surprised by just how peaceful and quiet this area can be. Unlike other areas in the Smoky Mountains, Wears Valley is known for it’s secluded setting and unobstructed mountain views. Although Wears Valley is a little off the beaten path, that does not mean that visitors will have trouble finding something fun to do just outside their rental. In fact, Wears Valley is home to quite a few delicious restaurants and fun area attractions, including Elvira’s Cafe, Smoky Mountain Alpine Coaster and Goats on the Roof. As we mentioned earlier, the cabins Wears Valley is just a short drive from both Pigeon Forge and downtown Gatlinburg. This means that all of your family’s favorite attractions, restaurants and shops are only a short drive away. Not to mention, the scenic views found in Wears Valley are truly unmatched when compared to other areas in the Smokies. Here, there are no bright lights and tall buildings to obstruct your view. Did you know there is a secret entrance to the Great Smoky Mountains National Park found in Wears Valley? That’s right. families and guests choosing to stay inside one of our large Wears Valley Cabin Rentals will love having the ability to skip over the heavy traffic and long drive time usually associated with visiting America’s most popular national park by opting to take this secret entrance. Also known as the Wears Cove entrance, this side of the national park offers many of the same scenic views that visitors to the Smoky Mountains have come to know and love. The entrance is located off of Little River Road. From Wears Valley, this road will take you passed several historical homesites in the park, including the Little Greenbrier School and Metcalf Bottoms. At Large Cabin Rentals, it is hard for us to imagine a better place for couples to celebrate their wedding day than in the heart of the Smoky Mountains. That being said, brides will not believe the picturesque views found at the many scenic Wears Valley wedding venues offered by our friends at Your Smoky Mountain Wedding. Located on top of a mountain, these venues offer an unobstructed panoramic view that spans for as far as the eye can see. The view stretches all the way from Bluff Mountain to Cove Mountain, and it included the valley in between. For more details on these venues, be sure to visit their website at www.yoursmokymountainwedding.com. If you would like more information on reasons you and your family will love staying in Wears Valley or if you would like to learn more about our many large group cabins, feel free to give our vacation experts a call. 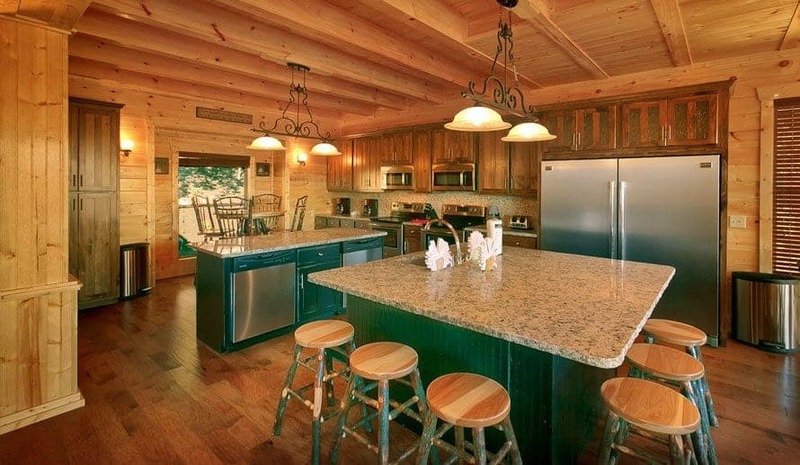 Not only will they help you and your group plan the most relaxing possible Smoky Mountain vacation possible, but they can also help you find which of our cabins is right for you.